According to many astrologers, planets which were retrograde at the time of our birth indicate karmic lessons we’ve brought into this life. Some say they’re an indication of latent genius in areas pertaining to the planet and sign in which the retrograde occurs, and which manifests later in life; still others, that those with retrograde planets are here to increase consciousness and create change on a global scale.Others claim that those with retrograde planets in their natal charts are seldom seen as they actually are. In other words, their full and true potential is hidden, and that there is often much more to an individual with planets in retrograde than can be readily seen. Because they are karmic in nature, this is an indication of a past life influence. Astrologer/visionary Barbara Hand Clow , states that retrograde planets allow us to bring gifts/talents, skills, knowledge and abilities from past lives, with us into the current incarnation. Astrologer Martin Schulman , says that retrograde planets are ‘absorbers,’ causing us to absorb or draw energy from others. While those with direct motion planets (those planets not in retrograde) are radiators: they tend to radiate their energy outward to others. Schulman also believes that through the retrograding planets, one is constantly attempting to resolve past-life issues, which in the current incarnation, seem to be unfinished. The energy of a retrograde planet is expressed more on an inner level. Retrograde planets cause you to stop and reconsider consequences. 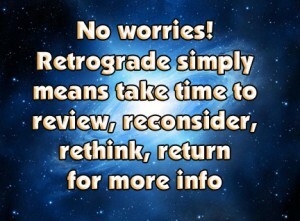 Viewed in karmic terms, retrograde planets indicate areas it would be beneficial to review and perhaps “re-do.” They can indicate internal struggles regarding unachieved goals or unfinished life lessons. Generally, natal planets in retrograde tend to internalize their influences, allowing you to work on your character. Below are some interpretations for retrograde planets found in the natal chart. Use these ideas as a basis for figuring out how to best use the retrograde energy in helpful ways. Mercury involves mental processes and communication, exploring ideas, seeking knowledge, writing, public speaking, making contacts, short trips and commerce. Mercury is retrograde at least three times each year, and is our most frequently retrograde planet. During this usually three week timeframe, we’ve learned to look for misunderstandings to increase, mail to get lost, messages delayed, misdirection and frustration with miscommunications of all kinds. For a few, this retrograde has the opposite effect. I feel this is true for anyone born with the retrograde in their natal chart, it’s a powerful time for us. New ideas, new speaking or writing abilities are often revealed in folks whose natal Mercury is retrograde. Are you normally hesitant or afraid to speak out? Do you find yourself very concerned with how others will take your words or what will happen if you speak your mind? You may tend to get improvements in both your usual internal and external dialogue. In karmic terms, natal Mercury retrograde suggests you may be dealing with old lessons about the consequences of uninhibited speech. Motives mean a lot to you. You could find yourself attracting criticism or opposition to your ideas. You can learn to overcome your fears. Apply your curiosity and take an active interest in the welfare or interests of people around you. Half of your ability comes from listening. If speaking to groups of people makes you nervous, let your thoughts escape into the outside world by writing. Make small talk wherever possible about any topics of interest, while you boost your self confidence and begin to overcome your hesitance of expounding your personal views in public. Venus involves pleasure, love, romance, relaxation, aesthetics, peaceful feelings, harmony, money, and values. Venus tends to work by attraction. Approximately every eighteen months or so, Venus slips into retrograde for about six weeks. While Venus is retrograde, you are may find yourself much more concerned with achieving or maintaining external beauty, your flow of ready cash, questioning your ideas of pleasure, aesthetics, or even revaluating your feelings about romantic relationships. Do you find yourself inhibited about seeking what you really want from your romantic partner? Does your ability to attract the money and attention you feel that you need seem to cause you problems? 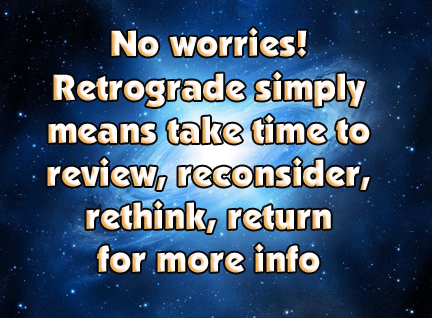 Is your natal Venus retrograde? A natal Venus retrograde can cause you difficulty achieving fulfillment or finding your right romantic partner. You may be more in love with your ideas about love than you are with any real person you know. In karmic terms, you need to complete a life lesson about giving and receiving love and affection. You are here to determine what is truly of value to you and learn about creating a balance of give and take in your romantic life. You will have to be willing to experience loving and being loved in order to attract what you desire into your life and create the feelings of security you need. * tends to repress and so …. Mars represents direct energy, physical expression, individual action and assertiveness, as well as anger, desire, sexuality, competitiveness and motivation for self interest. Mars energies tend to burst forward, with short duration. Every two years Mars goes retrograde for two to two-and-a-half months. What often results are frustrations in daily life as emotions become internalized. If you have natal Mars retrograde, you may find that you are waging an internal battle. This causes you difficulty in asserting yourself because you are afraid of the consequences of releasing your anger. You may tend to overthink before you act. You may find that you have a tendency to hold back. In karmic terms, you are likely to be attempting to make up for some past misdeeds you now regret. You are learning about yourself, defining who you are by what actions you take. You will need to let go of timidity or a lack of direction in order work out how you can initiate actions without creating the chaos of needless destruction. Natal retrograde Mars are prone to be uncoordinated mentally and physically and experience sexual difficulties. They’re also more likely to be more full of guilt and blame than most others. Grounding through meditation will help to regulate the various bodily systems to reduce adverse affects. Neptune retrograde in the natal chart is more common than inner planet retrogrades such as Mercury and Venus. About 40% of people have Neptune retrograde in their birth chart so it is less feared and less harmful than having a retrograde inner planet. That being said, Neptune retrograde natal still has karmic repercussions and a definite influence on soul growth due to the spiritual nature of the planet. Natal Neptune retrograde suggests that some area of life is so painful that you prefer to escape this reality through your own imagined dream world. It is likely that this tendency to avoid pain through illusion is strongly rooted in a tragic past life experience such as torture, where your only option to escape physical pain was to transcend from a physical to a more spiritual plane of existence. This earlier experience of spiritual pain relief was probably so intense and overwhelming that it became imprinted in your soul memory, in the DNA of every cell in your body. Past life crises like illness, false accusation and victimization will often be repeated to a lesser extent early in your life. You may notice you are the of subject to gossip, scandal or slander. I associate religious persecution with Neptune retrograde. Throughout history, the Roman Catholic Church alone has accused, tortured, burned, drowned and massacred countless millions of pagans, Protestants, Muslims and many other innocents. No matter the reasons, you come into this life with some justified fears and anxieties. Although not exactly as real or extreme now, certain experiences will trigger those more painful memories. Your natural reaction is to get rid of the pain by accessing that higher spiritual dimension. The quicker the better and you probably don’t care whether it is through meditation, prayer, your imagination or drugs. The release of pain relieving hormones in your brain is addictive so you could easily resort to escapism more often and for less critical reasons over time. You may use illness to gain sympathy or to avoid the harsh realities of life. Perhaps you are more subject to confusion and deception than most, or have a tendency to become involved in intrigues and scandals. False accusation and victimization will exacerbate your fears and anxieties around groups of people or certain people. Other karmic issues associated with Neptune retrograde in your chart could include misdiagnosed or mystery illnesses with the associated blame or guilt; or institutionalization for crime, mental illness or religious mania. Feeling isolated from society is common for many reasons. Neptune retrograde is likely to play some role in the case of the accuser, inquisitor or torturer. However, I expect that Saturn retrograde guilt and Pluto retrograde misuse of power would play bigger roles in these stories. This entry was posted in Uncategorized on October 8, 2015 by Andrea.